The Toyota Prius was Europe's top-selling hybrid in 2009 with a volume of 41,836. TOKYO -- Toyota Motor Corp., already battling an 8.1 million-unit recall on three continents, has been ordered by Japan's Ministry of Transportation to investigate a rash of consumer complaints about braking problems in its popular third-generation Prius hybrid vehicle. The Japanese carmaker has received several complaints about braking in the Prius in both Japan and North America since the end of last year, Toyota spokeswoman Ririko Takeuchi said. A Toyota Motor Europe spokesman said Wednesday that the company is not aware of any complaints in Europe related to this issue. Takeuchi did not say when the directive was issued or how Toyota would respond. She also declined to give a figure for the number of complaints but said most were filed since the end of last year. A computerized search for the 2010 Prius on the online database at the National Highway Traffic Safety Administration generated at least 102 brake-related complaints against the car. The U.S. complaints accounted for at least two injuries. Drivers typically complain about losing braking ability – often while driving over bumpy roads – or feeling the brakes give way. The Japanese government has received 14 reports of braking problems in the Prius, including one that cause an accident with two injuries in July, media reports here said. Problems with the latest generation of the Prius, which went on sale in the United States, Europe and Japan last year, would be another blow. The green halo surrounding the popular hybrid is largely credited for Toyota's image as a leader in environmentally friendly technology. In Japan, the Prius is the best-selling car. It is the best-selling gasoline-electric hybrid model in North America and Europe. 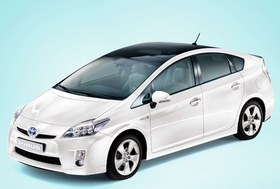 Toyota sold 41,836 Prius units in Europe in 2009, according to market researcher JATO Dynamics. Officials at Japan's Ministry of Transportation were not immediately available for comment. In Japan, 13 of the 14 complaints came in December and January, reports said. In the July incident, a Prius crashed into another car at an intersection, injuring two people.